Energy efficiency is an extremely important subject, especially if you are the person who pays the heating and cooling bills. Homes built in the past 50 years typically have HVAC (heating, ventilation, and air-conditioning) systems. HVAC systems are designed to circulate air throughout the home. Vents or registers are the places where the air exits or enters the duct work through a wall, floor or ceiling. If you want to close a vent to an unused room to save energy costs but the vent won't close tightly, you have some options to fix the problem. Like the human body, where blood flows away from the heart in arteries and flows back to the heart in veins, HVAC systems push heated or cooled air throughout the home with one system of duct work (supply). Another duct system pulls air back to the heat pump or furnace, where it is heated or cooled and recirculated throughout the home (return). A great deal of thought and calculation related to room temperature, humidity and air flow volumes goes into determining the size and shape of the HVAC system. You must determine if the vent or register that you want to close off is a "supply" vent or a "return" vent. Do not seal the vent if it is a return vent. Sealing return vents will cause the air pump or furnace blower to work harder and will likely cause damage. You can seal off supply vents, but do not seal off too many of them. Sealing off too many vents can cause damage to the system. Determining how many is too many is a complex calculation that will require an expert's guidance. However, sealing one or two supply vents will not affect the overall performance of the HVAC system. You should consider permanently closing the opening if the vent is part of a system that is no longer in use. Install drywall in the old vent opening, then tape, texture and paint the patch to match the existing ceiling finish. If the HVAC system is still in use and you want to seal an old vent cover that doesn't close properly, the simplest method is to replace the old vent or register cover with a new one that works properly. The least expensive method to seal the vent opening is to remove the vent cover from the ceiling, cut a piece of cardboard to fit inside the vent cover, tape the cardboard in place with polyurethane tape, and reinstall the vent cover. 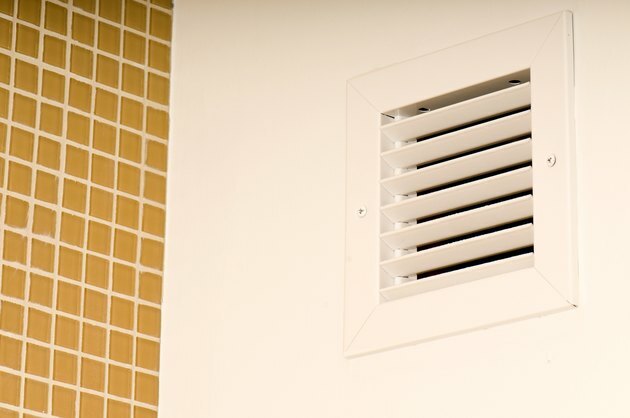 How Do Return Air Vents Work?